My friend Wayne sent me a handy little Christmas gift a few weeks ago. I intend to use this scale mainly for modifying shooting heads and fly lines, but I'm not totally set up for it yet. In the meantime, I decided to weigh some tubes and hooks, just for kicks. The first experiment was comparing a thick walled, HMH copper tube (1.5") to an old Partridge Code Q low water double (sz. 1/0). I wanted to tie a flies of a similar size and compare total weights. The fly of choice would be the General Practitioner. The Partridge hook is quite heavy (1.5 g), but the tube alone was 25% heavier. (2 g). When I added materials to both, then a #4 Loop double tube hook on the tube G.P., the tube fly became significantly heavier. I've tried to cast the tube version of this fly before. It's not pleasant. The flies are roughly equal in length, but the tube version weighs quite a bit more (see pic above). I should try this again with a thin walled copper tube and see what I get for results. I think it would end up about the same weight as the conventional fly based on the Sunray experiment below. The next experiment was less scientific. I wanted to compare a Daiichi 2271 streamer/Dee hook (sz. 2) to an aluminum tube. Then, weigh a fly tied on the 2271 and compare it to substitutes tied on an aluminum Shumakov long range tube and a conventional aluminum tube. I didn't bother doing all the permutations. I feel like I had a good idea of how everything compared. In the example above, I wanted to see how long of an aluminum tube I'd need to equal the weight of the hook. The total length of the tube and hook is a bit longer than the 2271, but the tying space on each is roughly equal since we don't typically tie on the tube hook. So, this heavy streamer hook weighed about as much as a similar sized aluminum tube and single hook. The example above is the least "scientific" of the group. The flies are different, but I most likely wouldn't tie a feather wing streamer on a tube. I would have no problem fishing this Shumakov-style tube fly in place of The Chief, however. I had this in mind because of what happened to this particular streamer. I was fishing for landlocked salmon at the base of a concrete dam. I thought The Chief would be a good option. All it took was one errant backcast and I knocked the point off a decent streamer fly. The fly, which didn't live long enough to catch a fish, has since been relegated to casting practice. I weighed an intact version of the same fly. It also weighed .6 g, so the missing hook point doesn't weigh enough to make a difference. The Shumakov tube fly is a hare longer and fuller, though I doubt the materials add much to the toal weight. Even though the tube fly weighs a bit more, I doubt it would sink faster than the streamer. 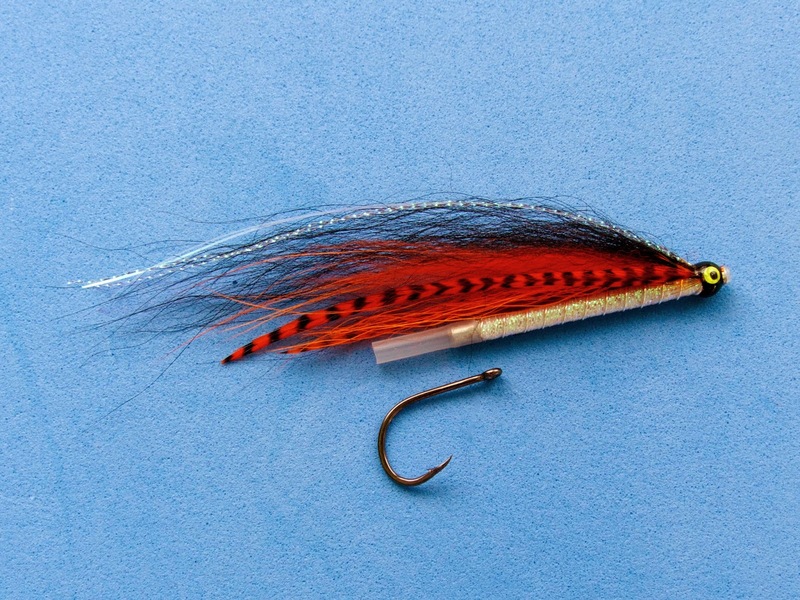 The streamer is slim and cuts through the water. Maybe they would sink at the same rate? I don't really care enough to take this experiment that far. Anyhow, little was learned from this experiment other than that Shumakov bottle tubes weigh more than I thought they would (especially the brass and copper bottle tubes). I discovered that by weighing them on their own. The most important lesson gleaned from this has nothing to do with weights or measures. When you're fishing in front of a concrete dam, use the tube fly instead of the streamer, dummy! To me, the last experiment was the most interesting one. I tied three virtually identical Sunray Shadows on tubes of different materials. The metal tubes were each 1.25". The plastic tube was a little longer to make up for a lack of junction tube (which adds a little length to the overall fly body). The flies were all the same total length. I used a light wire hook with the plastic tube, a medium wire hook with the aluminum tube, and a heavy wire hook with the copper tube. You can see the results above. I was surprised how close in weight the plastic and the aluminum tube flies were. The difference, .2 g, is hardly anything. My friend John told me he raised a salmon (twice) on an aluminum tube fly I gave him. I was surprised to hear that he fished it hitched. I had never heard of anyone hitching an aluminum tube fly before, but I guess it worked just fine! The copper Sunray was twice as heavy as the aluminum Sunray. It would be interesting to tie and weigh a brass and a tungsten Sunray to see where they end up on the spectrum. My guess is the brass would weight around .8 g. I have no idea what the tungsten would weigh, but I wouldn't be surprised if it weighed twice as much as the copper. I'm not sure a tungsten Sunray would be very useful. I need to get to Harbor Freight tools soon. I need a heat gun and some shrink tubing so I can start messing with lines and stop weighing tubes and hooks! Oh well, it's something to do in the winter. Thanks again, Wayne!